Katama Airfield hangar finally wins approval. Mr. Donaroma played a leading role in the defeat of the housing bank on the town meeting floor on Tuesday night, arguing that the proposal was premature and needed more work and discussion, putting forward a plan for the coming year. In the only other contest on the ballot, Richard S. Knight easily won election to the Martha’s Vineyard Land Bank commission, beating Mr. Krowski, who also ran for the seat. The vote was 432-148. Donna L. Goodale, board of assessors, 518; Harold T. Zadeh, board of health, 503; William C Bishop 4th, constable, 537; Steven C. Jordan, finance advisory committee, 453; James K. Carter, finance advisory committee, 486; Justine Shemeth DeOliveira, library trustee, 512; Olga Church, library trustee, 466; Glen Searle, park commissioner, 539; Glen Searle, planning board, 511; Glen Searle, wastewater commissioner, 516; Kelly M. McCracken, school committee, 503; Scott Ellis, water commissioner, 543 (top vote-getter). Oak Bluffs In the lone contest in Oak Bluffs, longtime land bank commissioner Priscilla Sylvia was unseated by challenger Kristen B. Reimann 308-156. Total turnout was light, with 494 voters casting ballots out of 3,825 registered. A question to exempt the debt for spending on a feasibility study for the regional high school was rejected 296-138, but the outcome was moot because the spending had already been defeated on the town meeting floor Tuesday night. Incumbent selectman Gail Barmakian was reelected with 344 votes. Incumbent selectman Cynthia Mitchell was reelected to an eighth term with 209 votes. Daniel A. Waters, moderator, 236; Jessica D. Miller, board of health, 229; Richard Neysa Cohen, board of assessors, 215; Tara J. Whiting-Wells, town clerk, 248 (top vote-getter); Jeremiah Brown, tree warden, 228; Frances A. Finnigan, library trustee, 222; Wayne Smith, library trustee, 191; Jane Dreeben, finance committee (one-year), 211; Mark C. Bernard, parks and recreation committee, 214; Virginia C. Jones, planning board, 216. Roughly a million dollars for a hangar that very few Edgartown citizens will ever be allowed to walk into. I hope the rental fees cover this expense, but I have a feeling this is just a gift from the taxpayers to the few that own planes and don't want to pay for their own garage. Anyone noticed how much higher the Edgartown tax rate has grown over the past few years? They're up 75% over the past 10 years and that's with median home values almost doubling at the same time. As home values increase taxes should be dropping - if they are both going up significantly there is a spending problem. How is a new bigger hangar part of the "fabric" of Edgartown? This money will serve very few people. Most won't be allowed to even enter it. The Yellow house was another big expenditure along with the Captain Warren house that Edgartown taxpayers got hit with. One we sold at a loss - the other will eventually be rented at a loss. We can have everything people want, but then don't complain about affordable housing when taxes continue to increase. Glad to read someone gets the money issue in Edgartown, now if only the voters can understand it. We are drunken sailors when it comes to spending. Congrats, people of Edgartown. We are now funding something that a very little percentage of Edgartown folks actually use. I understand we as a town want places to look nice, and that the hangar has been in need of repair for so long, but the people who actually use the hangar should have stepped up to the plate. I don’t know about you, but it seems to me if you can own a plane, you can pony up some money to have the hangar you use be up to snuff. The argument that this is a million dollar building being built for the benefit of a few people who have planes is not entirely accurate. The new hangar will be a public building (with public restrooms) that includes an office for the Airfield Manager (this does not currently exist), a classroom for community functions, and space to house all the equipment that is needed to maintain the airfield. 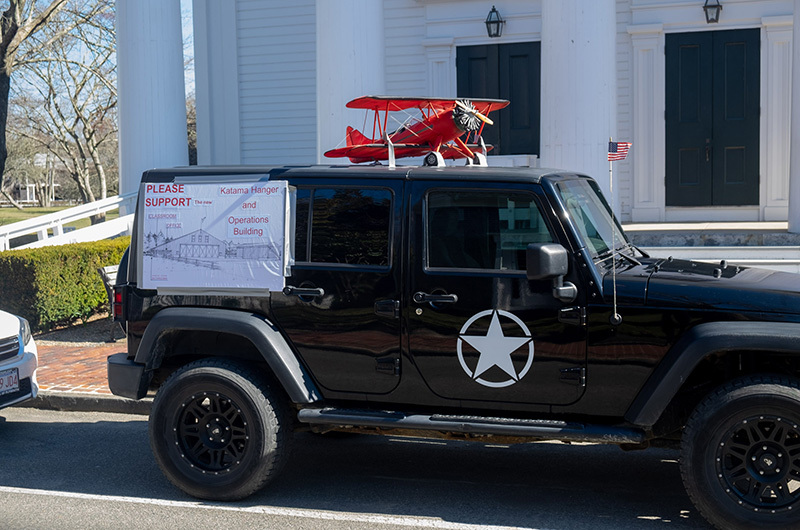 Yes, it will protect some planes as well, but this new building will be for the benefit of any member of the community that chooses to visit it, and the loss of a current potential liability for the Town. It is a lot of money, but it's also more than just a building for three planes. Maybe that helps ease the sticker shock? This is good. The town owns it and the town gets to use it. Im looking forward to more meet and greets at the airport once its finished. I wish I could afford a plane. I’ll assume those that use the hanger will pay an increase to help cover the cost? In fact, the entire cost should come from those that use it. Amazing! I went to the Annual Town Hall meeting to hear the Discussion for and against this proposal . The ones that made the most sense were the gentlemen who were questioning why so much money and who was going to benefit from a larger new hangar? The picture listed above says it all that it will clearly benefit the commercial airplane ride businesses there. One of the selectman was quoted as saying after learning that the new hangar was approved that this is a good thing and that it’s not about the money. Huh? Only time will tell . Will see if the tax payers money is supporting the expansion of a private enterprise and not for the benefit of transient pilots as it is meant to be. Something smells fishy to me?